Soft Matter, 2012, 8, 1460-1466. In this paper we report the synthesis and study of a series of side-chain selenium-containing amphiphilic poly(ethylene oxide-b-acrylic acid) block copolymers PEO-b-PAA-Se. These block copolymers can selfassemble in aqueous solution and form spherical micellar aggregates. The selenide group of PEO-bPAA-Se can change into hydrophilic selenoxide under mild oxidation of 0.1% hydrogen peroxide, leading to the disassembly of the spherical micellar aggregates. Small compounds like Nile Red can be encapsulated into the micellar aggregates and show fast release upon the addition of 0.1% hydrogen peroxide. More interestingly, the oxidation state of selenoxide can be reversed to selenide under reduction of Vitamin C, thus recovering the spherical aggregates. The reversible oxidation and reduction process shows good reversibility and can be repeated at least 7 times. 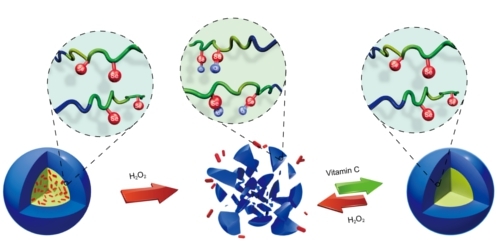 It is hoped that this reversible redox controlled system may function as nanocontainers for potential application in the areas such as responsive drug delivery and anti-oxidation studies.